SOMETHING TO CROW ABOUT: Parent volunteers and members of the Hanson-based United Bantams 4-H Club stand behind their renovation work at the Marshfield Fairgrounds. Photo by Tracy Seelye. MARSHFIELD — The United Bantams 4-H Club, based in Hanson, is a group of chicken enthusiasts on a mission for the 148th annual Marshfield Fair Aug. 21-30. They’ve spent the past month working two to three times a week — almost 40 hours — renovating the old 4-H poultry barn at the Marshfield Fairgrounds. Members and parent volunteers have been updating displays and cages as well as adding new features to a wing of an L-shaped building they will share with a photography competition and model train display. The chickens have, indeed, come home to roost — and they’ll be joined by ducks and some other feathered friends. Neighboring dairy and sheep barns, by contrast, had retained their 4-H management all along. As she spoke parent volunteers Peter Trask and Shawn Barry were climbing up on the roof to restore the “Poultry Show” sign Trask’s wife Lisa repainted, along with a sign bearing the 4-H four-leaf clover logo. “There was a falling out many years ago and what we’re trying to do is mend some bridges, and get this back to being a 4-H barn,” Drake said. The late Plympton Selectman Joseph Freitas “taught us everything about raising chickens,” according to Drake. He instructed the United Bantam members how to hold, feed and care for their birds. Freitas, known as “chicken boy” among friends, was active in the Plymouth County 4-H program for 25 years as the leader of the Fowl Play Poultry Club of East Middleboro and served on the Board of Trustees. His widow Jacqueline, who attended a recent “Chicken Run” obstacle course fund raiser to help pay for the barn renovation, is scheduled to be the guest of honor at a ribbon-cutting for the rehabbed poultry barn Thursday, Aug. 20 — the night before the fair opens­ — according to Drake. 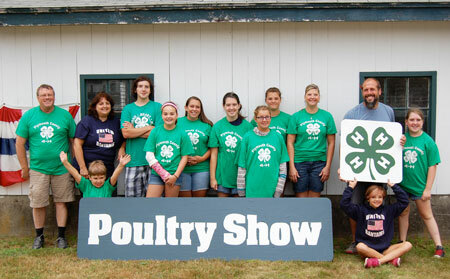 After a lengthy absence in the county, the United Bantams 4-H Club was the first poultry club to return. Drake noted there are now almost a half-dozen poultry clubs in Plymouth County. Among the nearly 20 members of United Bantams, some joined to forge friendships as well as to learn more about backyard poultry. Among those is Isabel Barry, 14, of Hanson. Her grandmother had also suggested she join 4-H.
James Furness, 16, of Abington has been active in backyard chicken raising since he was in the first grade. His two brothers found it less enthralling, mom Lisa noted. “I always loved the baby chicks and they always asked, ‘What are you going to do when they grow up and become chickens?’” James said. By the time he began 4-H three years ago, he had begun his own project with three full-grown laying hens. He built his own coop with the help of his dad Bill, who has been a carpenter for 30 years. James’ assorted flock of seven hens all have names, flouting rule one of farming, “Don’t make them pets,” he joked. Khloe Drake, 9, followed her mom into raising chickens, saying she likes their soft feathers best. That growth has occurred within the past five to 10 years — and can be found in some urban settings as well. “We’re trying to show that it is so predominant that it should have a face,” Drake said as parent volunteers and club members unloaded wood, paint and tools; took cages apart to clean and paint and sand plywood appliqué pieces for a mural backing a nesting box and brooder display where patrons can watch chickens lay eggs and watch eggs hatch. State health regulations also require all poultry exhibited must be free of visual evidence of infectious bronchitis, coryza, fowl-pox, external parasites and laryngotraceitis. “Nose-to-nose,” or nose-to-beak in this case, means birds will be displayed on lower levels where children can see them, and Plexiglass will be used for safety in some areas — especially in the nesting and brooder display. Steps will be placed near the nesting boxes (which are open in the back) so children can see better. Brooders, where eggs hatch and new chicks are kept warm, will also be lower. An indoor duckling slide will be included as well as “Mustang,” a resident duck who will be waddling about the nesting area among the chickens because he would be lonely if left home by himself, Drake said. Mustang will also have a small pool, to be placed under a tree on which chickens may perch. Outdoors, about 30 ducks will be splashing and swimming about in a fenced-in duck pond. “Someone will be available at all times to answer questions, holding chickens so children can touch and pet them,” Drake said. Parents are very involved in the club, which Drake noted is not a “drop-off club” and all parents of club members are CORI checked. Shawn Barry of Hanson has done much of the construction work along with Bill Furness of Abington.